Hello and happy Wednesday! Hope you’re having a great week so far. I’m back today to share a new and somewhat different card creation for Dare 2B Artzy. Last week on Friday I got the rare opportunity to leave work early and come home. It was just me and the dogs for a couple of hours. While I should have used that time wisely to clean and organize my craft space, I procraftinated (LOL!) and decided to play with my supplies instead. In the file box I keep on my desk with my “to do” stamps and goodies, I found a couple of sheets of Birch Plywood. I don’t know if you’ve ever crafted with Birch or even Balsa Wood? It comes in many different varieties for woodworking and crafts. The Birch Plywood I had comes in a sheet that’s 6 x 12 – much like you’d find a sheet of paper and is often a bit thicker than cardstock at 1/64th of an inch thick. You can find it at your local craft & hobby stores for around $2.00-9.00 depending on the size. It also comes in different thickness which is useful for various crafts and hobbies. Previously I wouldn’t have thought to utilize this type of wood for my card making. I’d always assumed that these thin sheets of wood were very fragile, but I discovered that it’s actually pretty durable. You can cut it with scissors however, I’m not sure if it would cut with a rotary or blade paper trimmer. You’d definitely want to use a deep, sharp blade if you’re going to cut it with a trimmer. The cool thing about Balsa Wood is that I’ve been able to use my steel rule paper dies to cut it and haven’t had any problems. I used a small scalloped rectangle die to cut a piece of the Birch Plywood and ran it through my Evolution die cut machine with no problems. Of course you do have to adjust your plates or machine to accommodate the thicker materials. My card today started out very much as an experiment, but often those become the best kinds of cards. I had heat embossed on wood that was painted or stained on different occasions in the past and loved the effect that it can create so I wasn’t sure what to expect with this type of wood. While I could have added a thin coating of Gesso to the piece of wood, I wanted to keep the natural look of it so I chose to experiment to see what would work. I tested various embossing powders on a piece of scrap wood I had first to see the results. I found that you really have to use an embossing powder that is made for super fine detail as the Versamark ink does absorb and spread (bleed) a bit into the untreated wood. Using a fine detail powder gives a better embossed impression so I ended up using Ranger Ink’s Super Fine embossing powder in white. I paired the wood with the cool leaf from the Dare 2B Artzy Paisley Bliss stamp set. I really love the gorgeous paisley images in this set – they’re so fun and versatile. I stamped the leaf image several times on the wood to create a background pattern, even stamping off the wood for a partial image. For this process I stamped and then embossed each image separately to be sure to get a good impression for the heat embossing since I was worried the Versamark would be absorbed too quickly into the wood. Once my embossing powder was set, I started to play with inks and paints to see what the various results would be on the wood. I ended up using the Spectrum Noir Sparkle Pens and painting each leaf with a couple of different complimentary colors; Inspired Violet, Aquamarine, Harvest Moon and Red Berry. I wasn’t sure how the sparkle pens would react with the wood since they are water based, but they didn’t bleed much at all. The colors do look a shade darker on the wood than on paper. They dried beautifully on the wood, however they pooled up on the white embossed edge so ultimately I used a round ink blending tool and blended the colors together a bit on each leaf being careful not to get ink outside the leaf outline. Since the Spectrum Noir Sparkle pens have a glitter to them, you can see a bit of sparkle on each leaf which was difficult to capture with my camera. Once I’d finished coloring each of the leaves from the Paisley Bliss stamp set that made up my background, I was ready to add my sentiment. I used the same scalloped rectangle die cut a piece of pink floral paper from the Artzy Doodles Variety Paper Pack and a piece of white cardstock at the same time. I really love that color of pink, it’s so pretty. I love how it kind of popped against my background of the leaves. Next I took my scalloped edge die and cut the pink Artzy Doodle paper so that it was slightly larger than the white cardstock. My sentiment Find Your Bliss and one of small paisley stamps was stamped on the small white cardstock with Versamark and heat set with some Carnelian Embossing Powder. I added some dimensional foam to the back of my Balsa Wood panel and adhered it to a white A2 size top folding card base. For a finishing touch I glued on some clear crystal dew drops to the card front. It is fun seeing a crafting experiment with different materials come to life as a completed card. I guess I should take more afternoons off work to get crafty. Work less…play more – sounds like a good plan. Hope you’re inspired to look around your crafty space or even on your next trip to the hobby store to see what things you can use for your next stamping & card making adventure. 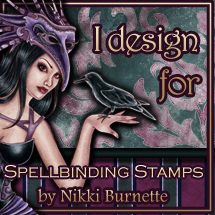 Don’t forget to check out the Dare 2B Artzy store for a ton of great stamps & dies. If you’re looking for the Paisley Bliss stamps I used in today’s project you can find them here. Don’t forget that the Coffee Loving Cardmakers Summer Blog Hop kicks off on Friday, June 23rd through Friday, June 30th. Dare 2B Artzy is a super sponsor again so look for some amazing inspiration from the Design Team and be sure to hop along the way and leave some love for your chance to win! Thanks for stopping by! Have a fabulous rest of your week!